Imagine a world where IoT data was automatically distributed with inherent integrity and protection. Where you didn't care what the network or user devices. Where this could happen seamlessly from both inside and outside of a company. Where data can travel anywhere it needs to without being corrupted or vulnerable. Where data is virtually immune to the consequences of data leakage and compromise. This is the world that IONU’s Business solutions create. IONU’s Data-centric IoT Platform ensures integrity and protects data in all of these areas, without impacting end user workflow. IONU APIs are a critical element of the Data-centric IoT Platform. Our IOT APIs enable developers to easily develop secure IoT applications. APIs support device/user enrollment, group network creation, data distribution, local data save and data protection. Data integrity is an inherent feature with API integration. APIs are available across a broad set of platforms supporting several languages. 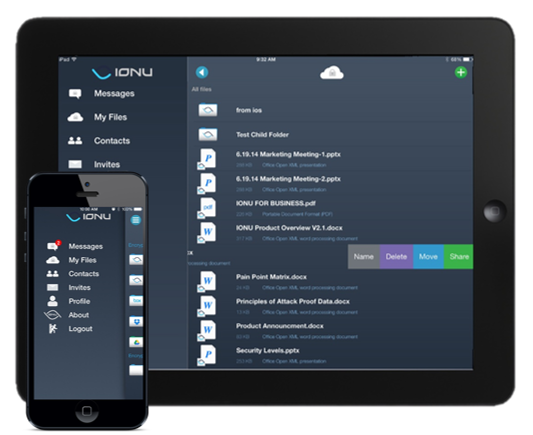 IONU’s Topology Management administration capabilities allow organizations to easily manage users and devices, monitor and log user activity and implement and administer policies within the network. Additional administration capabilities include group data sharing permissions, user device enablement and disablement and device and account deletion.